Lakitu Peekaboo (parsed Lakitu Peek-a-Boo in PAL versions) is the second level of World 4 in Yoshi's Woolly World. The level starts with an autoscrolling segment consisting of Wall Lakitus attacking Yoshi. After a while, Yoshi will reach an area with many Wall Lakitus, as well as a Winged Cloud that reveals a door when hit. Taking that door leads to a vertical segment consisting of more sponge dirt than ever before in the level. After this segment, there is a door leading to another segment: one consisting of a vertical drop containing sponge dirt. The first checkpoint follows this. Afterwards, there is a segment containing falling platforms. The player must jump up onto the fallen platforms while avoiding getting squashed by other falling platforms. Following it is the door to the second checkpoint, and then a segment with even more sponge dirt and more Wall Lakitus, including a few spring balls. The final spring ball, unveiled via a Winged Cloud, takes Yoshi back to the ground level, where the goal roulette awaits. Smiley Flower 1: In an alcove immediately after the first Wall Lakitu. To get it, Yoshi must avoid touching the falling platform, then ground pound the sponge dirt and move to left to reach the Smiley Flower. Smiley Flower 2: In a hidden Winged Cloud before the door just before the first vertical segment. Smiley Flower 3: Behind an edible wall during the last vertical sponge dirt drop before the first checkpoint. Smiley Flower 4: In a Winged Cloud just before the end of the falling platform segment. To get it, Yoshi must quickly throw a yarn ball at the Winged Cloud before it becomes more difficult to do so, then grab the Smiley Flower before it gets covered up by another platform. Smiley Flower 5: In a hidden alcove below the second checkpoint. To get it, Yoshi must go up and around, ground pounding the final patch of sponge dirt, and continuing left, past the final spring ball, to the Smiley Flower. Wonder Wool 1: Revealed by hitting a visible Winged Cloud next to the first Wall Lakitu. Wonder Wool 2: In an alcove. To get it, Yoshi must jump from the left side, jump off the platform before it starts to fall, and flutter jump to the Wonder Wool. Wonder Wool 3: Behind a movable wall at the bottom of the sponge-dirt pit just before the first checkpoint. Wonder Wool 4: Just after entering the door after the first checkpoint, amid the falling platforms. Yoshi must work his way to the Wonder Wool before more platforms cover it up. Wonder Wool 5: Through the door unveiled by the second hidden Winged Cloud after the second checkpoint. Inside this secret area, Yoshi must use the nearby spring balls to reach the Wonder Wool. 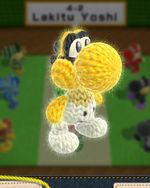 Collecting all of the Wonder Wools knits Lakitu Yoshi back together.